Q: Should I worry about eating soy? A: No. 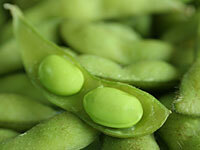 If you’re a healthy woman with no history of breast cancer or thyroid disease, soy can be part of a balanced diet. Chances are you’ve heard confusing reports about soy. Some say it’s a healthy superfood; others claim it boosts cancer risks. Here’s what we know for sure: Soy foods are high in protein, fiber, calcium, potassium, and B vitamins. And a European research review found that soy could lower heart disease risk and relieve hot flashes. So, eating a little soy each day is OK for healthy women, experts agree. But there are caveats. Soy should be eaten in moderation because it contains phytoestrogens, which act like estrogen in your body—and too much estrogen can cause some breast cancers to grow. In fact, studies show that high-dose soy supplements might up breast cancer risks. “To be safe, women with a personal or family history of breast cancer shouldn’t eat soy or take supplements,” says Katherine Lee, MD, a surgeon at the Cleveland Clinic’s Breast Center. Soy may also interfere with the functioning of the thyroid gland, which controls how efficiently you burn energy. Bottom line: If you’re a healthy woman with no history of breast cancer or thyroid disease, soy may help you. If you’re interested in soy supplements for menopausal problems, ask your doc first about your personal risks. It’s OK to eat soy once a day in natural forms like edamame, and the foods below. One study showed you can cut five points from your total cholesterol by eating soy foods instead of red meat. 30% of people eat soy foods at least once every month. Women who eat soy as children may enjoy a 60% decrease in breast cancer risk.